It can be a blessing to dine alone. Sure, there’s no one at your immediate disposal to talk to and ease moments of potential discomfort, but you could rouse up a bit of casual conversation with your server if you’re desperate. Pay attention to the people around you. Daydream. Read a book. Don’t be afraid to request a table for one; it can be a luxury. But if dining alone is new territory for you, here are some places to try that might help you ease into that solo dining life. Claim a spot at Saint Burch’s raw bar and you’ll be so entertained you won’t even notice you’re alone. The refrigerated cases are lined with the day’s selection of fresh oysters, and the chefs behind the raw bar are busy shucking orders and preparing seafood towers. There are not a lot of opportunities to watch someone shuck oysters here in the Midwest, so I find it intriguing. 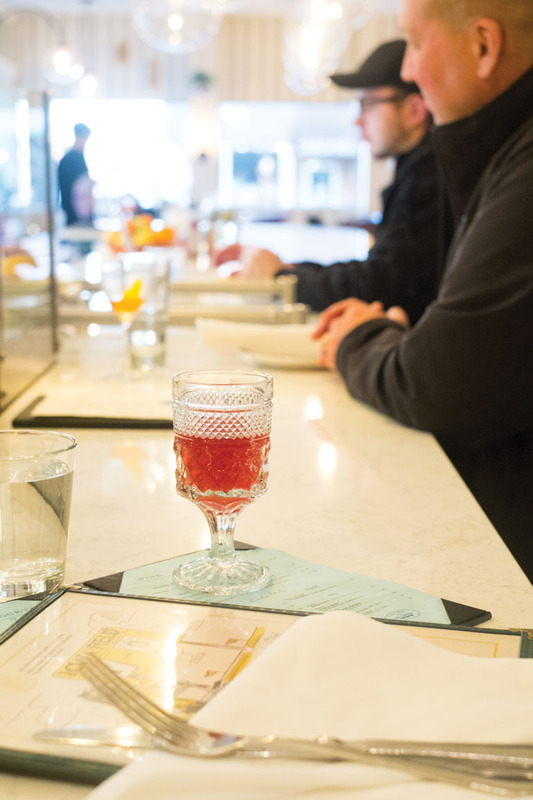 If you lose interest in the seafood, just a few seats down the counter is the actual bar where bartenders are vigorously shaking cocktails and pouring glasses of wine. Over the dinner hour things get busy, and watching the bartenders and servers navigate the space and orders is like watching dancers perform a graceful ballet, something I never tire of. The cafeteria-style seating on the expansive indoor/outdoor patio is the ideal option for a solo diner, but my favorite spot here are the stand-up counters (with stools available if you like) that run the length of the wine department. You’re flanked by literal walls of wine which is an obvious plus if you need a little eye candy to keep you occupied. Yes, you might get a little cozy with your neighbors, but it’s somehow a bit quieter over here and feels like a nice escape from the hustle and bustle of the rest of this high-volume lunch and dinner spot. It’s a great perch on which to enjoy your $5 gourmet pizza—you’ve tried those automated kiosks, yeah? The cozy bar area is one of my favorite dining spaces in town. The long banquette is nestled with a handful of small marble tables that are great for two people but really pretty perfect for a solo feast—you can spread out and sample a few different dishes with a nice glass of wine. From this vantage point, you’ve got eyes on the pizza oven, bar activity and if you must, the tv. There are plenty of smaller plate options on the menu (salads and appetizers) but your best option is to order a wood-fired pizza. It might be too much for you to finish in one sitting—no judgment whatsoever if it’s not—but it’s pretty generous in size and cut into six slices, so depending on what else you order, you’ve taken care of dinner tonight and lunch tomorrow. If that doesn’t sway you, the handmade pasta here is superb and will surely satisfy. Again, this is a great spot to observe skilled chefs and restaurant staff work their magic. If you’re dining solo, snag a spot at the coveted sushi bar and watch as owner Vincent and his team tackle the orders rolling in and the spectacular show that unfolds. The flurry of activity and delicate knife work will retain your attention; you won’t need to scroll on your phone or pack reading material. The fish is fresh, the presentation artful and the atmosphere welcoming and cozy. This cozy and romantic restaurant is nestled in a strip mall in Cedar Rapids. As perfect as it is for a date night for two, it’s worthy of a treat-yourself solo moment as well. The intimate lounge area is a great spot when you’re in the mood for a drink—lounge-style seating, bar seats and booths are available depending on your mood. If sitting alone with your thoughts and a martini is a terrifying thought, the walls of the lounge are lined with old books from the Cedar Rapids Public Library and ripe for perusal. When you’re ready for dinner, the Italian fare on Vino’s menu is bound to be captivating enough that you won’t even miss having a dining companion.